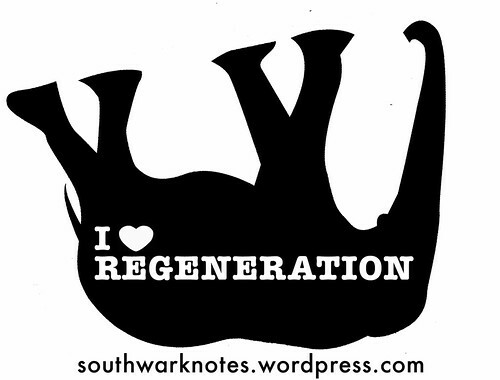 Poor Old Shopping Centre | Southwark Notes - whose regeneration? 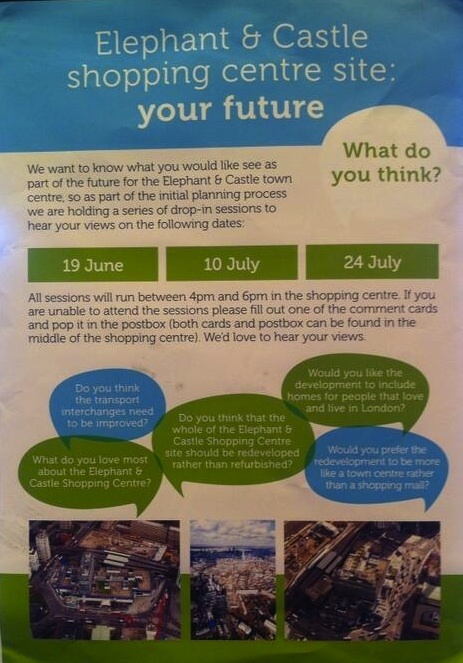 Here follows our quick replies to the above 5 questions asked by the new owners of the Elephant Shopping Centre as part of their community consultation on the Centre’s future. The new owners are Dutch pension fund APG and UK property developer Delancey. Delancey is also the managers behind the large development behind the Centre that borders New Kent Rd, Elephant Rd and Heygate Estate formerly known as ‘Oakmayne Plaza’, then ‘Tribeca Square’ and now the wonderful ‘Elephant One’ (not to be confused with Lend Lease’s nearby 40+ storey tower of luxury flats called ‘One The Elephant’. 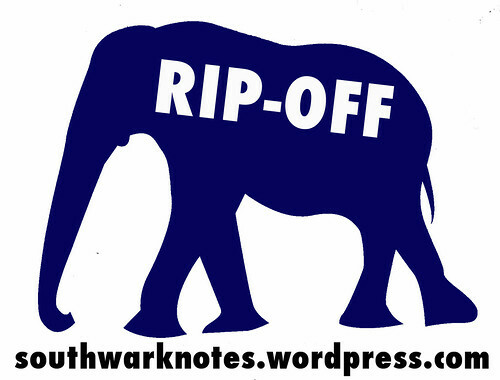 At Southwark Notes, we are already phoning up global finance houses to back our new exclusive residential development in the northern roundabout – a 100-storey tower called ‘The One Elephant’. Are Delancey going to stump up hard cash for any Northern Line rejigging and other works such as the crowded bus stops outside the Shopping Centre? This has always been a bone of expensive contention between Southwark, Transport for London, The Greater London Authority and any developer of the Shopping Centre. 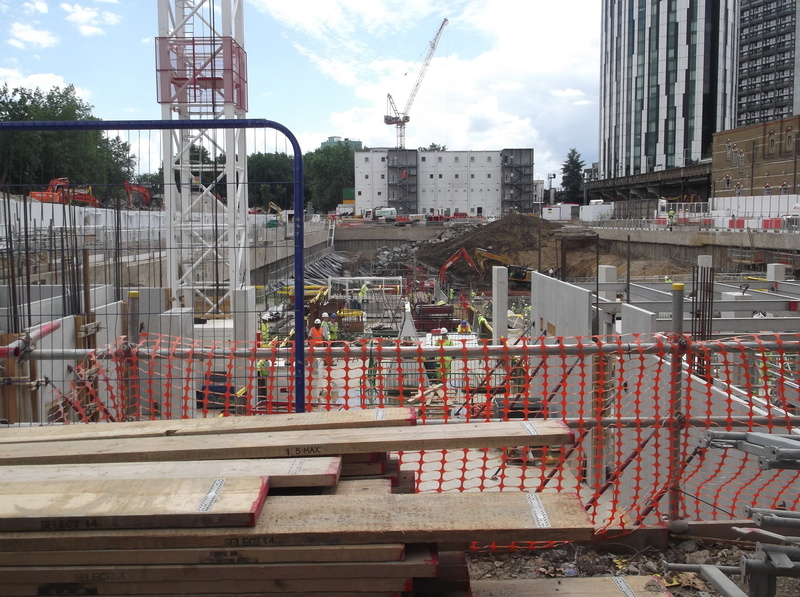 The GLA has already agreed to substantially fund the approx £100m cost of remodelling the northern roundabout and rebuilding the Northern line tube station with escalators to replace the current lifts. Presumably those who use the Centre would answer that it fulfills basic needs via supermarkets and small services and wide range of cheap shops plus socialising spaces like cafes, restaurants and benches. If the shops and services moved into a higher price range then we are guessing that this would move it out of what most people like or ‘love’ about it although this might be what new residents to the area might want. They may not indeed want Greggs, Sundial Cafe, Jenny’s Burgers, H&T Pawnbrokers, 99p Stores or Quicksilver Amusements. Now and as it has always been, with the regeneration of the area being ongoing for the last 15 years or so, no guarantees have been forthcoming from the Council and owners to protect the existing businesses in the Centre and around it – such as the small shops on New Kent Rd (dentist, newsagents) and The Coronet (who are extremely worried about their future). The provision of affordable retail spaces in new developments included as alternative sites for displaced Elephant traders has been pitiful. There is still an empty unit built with this in mind at the Pavillion building (part of the Strata development). Not much bigger than a shoebox and with zero thought put into delivery, storage, vents and so on, it’s a wasted tokenism. They are answering their own question as this is there already announced intention. 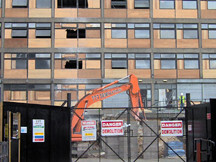 So they are only really looking for YES in answer to this question: “The first thing is that we are looking to demolish the centre and redevelop it” said Delancey’s Stafford Lancaster in February 2014. This is also their stated intention anyhow as private homes will be where the profits are to be had and less in building a new shopping town centre. It’s a debatable point whether the Council will to act to limit the number of new homes here and hence the problems of density, massing and heights and light, effects of local services, questions of car parking provision, etc. Delancey have already more or less said they want to build up to 1000 homes on site. What actual space will they use to build the shops and what spaces would they use to build the homes? 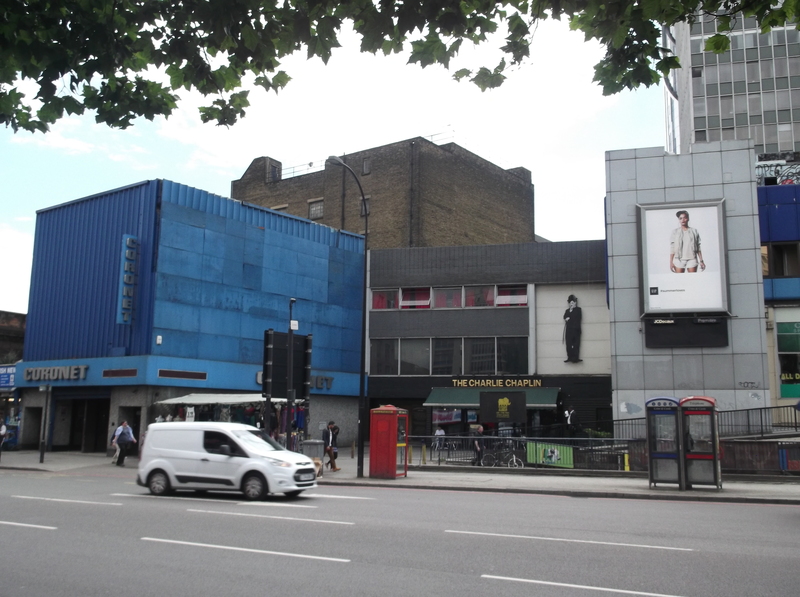 An article from Property Week (‘Delancey and APG buy £80m Elephant & Castle shopping centre‘, Dec 2nd 2013) says that the new joint venture is planning 500,000 sq ft on the shopping centre site. This is an increase from 327,000 sq ft at present. We wonder where all these shops and homes will fit. 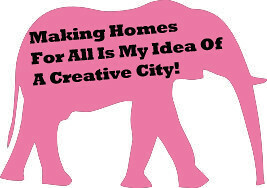 And if we are talking about ‘homes’, then we would need to break that down into what kind of homes are they planning? Delancey has already stated that they are planning for 1,000 or more new homes, which will be private flats for rent so they retain ownership and act as overall landlord, give or take the odd contracted in management company. The gradual erosion of any local policy that is enforced on getting some ‘affordable’ housing back out of developer’s profits means we can probably expect a minimal of affordable rent properties (with starting prices already too high for local people). Will there be any social rented properties at rent levels equivalent to council rents – i.e necessary and genuinely affordable. Would there also be any guarantees that the higher end private flats they build will be rented by people who actually live in them as opposed to those who ‘Buy to Let’? With already so many overseas sales as investments and not actual homes as standard for new developments in Southwark, this is a real key question for any community consultation. Who are these homes meant for? We are sure that as there are currently almost zero homes currently on site, the argument will be put that local people’s concerns on true affordability can be put aside as no residents are really being displaced. 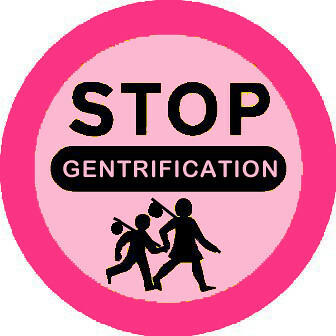 However, if more and more developments go up at the Elephant that contain no real affordable housing then they are creating another wealth ghetto as a supposed solution to breaking up the mythical poverty ghetto at Elephant. 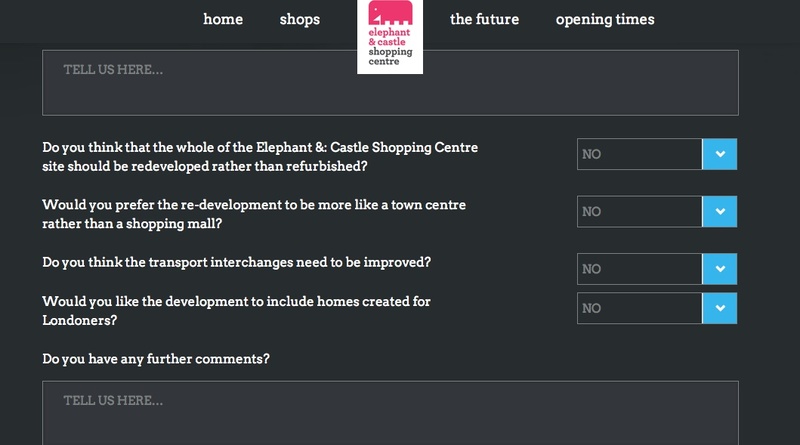 Should you have other answers to the ones we thought up, don’t bother attempting to put them into the Official Shopping Centre The Future website as you can only answer ‘YES’, ‘NO’ or ‘MAYBE’ to the same questions. About as subtle as the usual consultation game brick to the head. 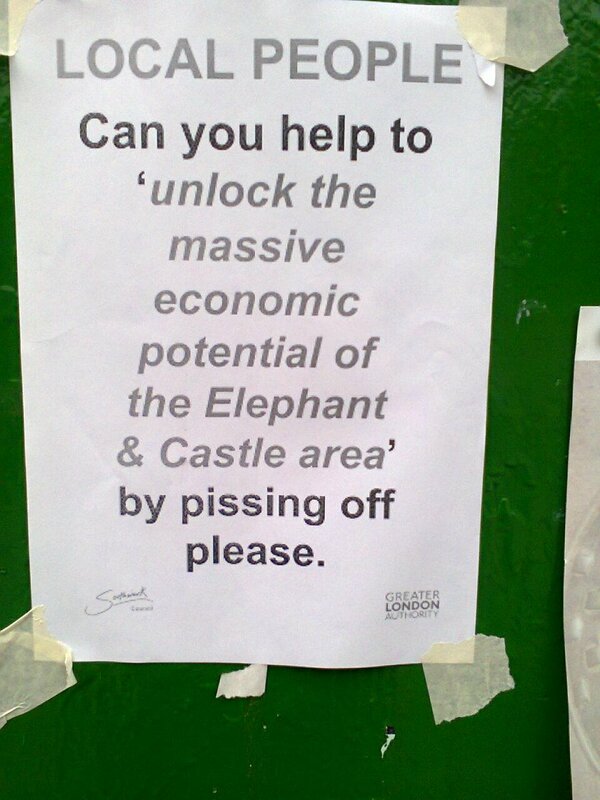 This entry was posted in Uncategorized and tagged delancey, Elephant & Castle, elephant castle shopping centre, elephant one, Gentrification, Regeneration, Southwark, walworth. Bookmark the permalink.